'I knew it,' Kaede thought. 'Not only did they not send me a map along with the other stuff, they don't have any signs or other directional help here at all.' He looked around for a bit. There didn't seem to be anyone that was supposed to wait for him either. Maybe he could ask someone for directions... No way. Kaede was determined to solve this himself. Relying on others at the moment he had arrived was out of the question. Let's see, there are three buildings as far as he could see. One seemed to hold a sports hall and related stuff so the teachers office was probably not there. He decided to head for the building right in front of him where also most students were going. It was almost time for class, but Kaede was there at the time he had been told to so he wasn't exactly in a hurry. Gino stepped from the school bus, his uniform coat unbuttoned and tie untied. He held his bag over his shoulder while his other hand held the strap to a camera bag. Today he and Reo were going to go over the footage from their last hunt two nights ago. Gino didn't believe in all this ghost nonsense, but he was too invested in the club to leave. Besides, he had promised his best friend Aki that he would keep an eye on it now that he had moved away. Gino went to his locker and began to unpack his backpack. "Heeeey." A big guy came over and clapped Gino on the back. Gino nodded and they began to talk about football practice amongst themselves. Everyone knew Gino was in the ghost club, but no one really minded. Gino was popular and while no one else seemed to have an interest in the club, the fact that Gino was in it made it cool. Well, perhaps not cool, but not entirely lame either. 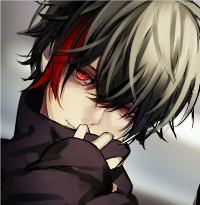 Reo bustled down the halls, talking to his fellow classmates and just being all around loud. He was Senpai to many and a friend to all. As a student embassador, Reo was the student to help new kids acclimate and today he was finally able to do his job! He made his way to the teacher's room where he was supposed to meet the kid, but he was no where in sight. Reo asked one of the teachers if they knew who the new kid was, but none of them seemed to know. "He's some dark headed kid. I heard the principal talking about him." A male teacher spoke over his coffee. "Shy kid, great academic record." Reo nodded, his blonde hair bouncing as he did and thanked the teacher before exiting the room and looking for the new guy. It didn't take long to spot the poor fellow. He looked lost and a little nervous. Reo walked up and placed a shoulder around his arms. "Hey there, you must be Kaede." Reo held out his other hand for the boy to shake. "I'm Reo. I'll be your student embassador for the week until you get used to the place. It's great cuz I'm excused from being tardy to class!" Reo peered to the paper in Kaede's hand. "Need help finding your first class? Got any questions? I'm your man." Kaede didn’t know that he was already on the right way towards the teachers office as an upperclassman practically pounced him. The upperclassman immediately started to talk like a waterfall. Kaede shook his hand and at the same time escaped from his ‘hug’. He basically only nodded once because there was no room for actually talking. “Since today is your first day we’ll start with a tour and I’ll bring you to your classroom later. It will be nice and quiet since everyone is in class.” Reo-senpai didn’t wait for a reply as he started to drag Kaede along. “They probably didn’t give you a map of the place right? Well, the layout is pretty logical so they didn’t think that you would need one. The place is kinda big but you’ll get used to it soon.” Since he couldn’t manage to get a word in between anyway, Kaede decided to just follow along and listen. But then Reo-senpai suddenly remembered something and stopped right in his tracks, almost making Kaede bump into him. “Have you been told that it is mandatory that you join a club?” he asked the new student with a serious face. At least as serious as his face can get. Kaede, whom had heard nothing of the sort, could only shake his head in denial as he expected his senpai to just continue talking. “I thought as much,” Reo indeed continued. “This school has a great academic record but when it is about communication with new students they greatly lack skills sometimes. What kind of stuff are you interested in?” This time Reo-senpai seemed to be waiting for an actual answer. The last option was so vague that it did pique his interest a little bit. “What are the unusual clubs?” he couldn’t resist asking. “For example we have a club for researching supernatural phenomena, this club researches rumours about supernatural occurrences and tries to find explanations for them so that the students and occasionally the general citizens can be calmed down. Just recently we managed to solve the third of the seven mysteries of the school.” Again, Reo-senpai talked without stop. Just that this time Kaede was actually interested. “Ah, I happen to have a club sign up form with me right now. Since you have to sign up for a club anyway, why not join one that actually interests you?” He started to rummage in his pockets until he found a wrinkled piece of paper and handed it to Kaede. Kaede was a bit surprised that he was expected to make a choice right away, and somewhere in the back of his mind there was a voice of reason warning him. However, this club did sound interesting and he could probably change clubs if it was too weird. Quite unsurprising was that Reo-senpai also had a pen on him so that he could fill in the form right away. And Kaede did start to fill in the form until a certain point. “Senpai? I need the signature of the club president to complete the form.” He diligently informed Reo. “It’s fine if you filled in all the other stuff,” Reo-senpai happily said while taking the form and the pen out of Kaede’s hands. After which he signed the designated area. “... Could it be that you are the club president of the supernatural phenomena research club?” Kaede asked with some precaution and already expecting the answer. “I prefer to call it ghost club, that’s shorter. And just call me Reo like everyone else.” Kaede couldn’t help but notice that Reo-senpai hadn’t directly answered the question. But also that there had been some people passing by while they had talked and almost everyone had greeted Reo in some way or another, even teachers seemed to call him Reo. This probably means that he is quite popular. And that couldn’t mean a bad thing for the club, right? How bad that could be was something that Kaede would find out soon enough. As the last bell for the class rang, he and Reo were still doing the tour. This time more seriously. Suddenly Reo-senpai started waving and calling out to someone. “Hey, mister student council president, over heeerreee~” A grim and strict looking upperclassman looked around and seemed to be the first person today to be displeased to see Reo-senpai. Although that didn’t look as if it concerned Reo at all. He happily pushed a wrinkled piece of paper into the student council president’s hands that looked a lot like the club form that Kaede had just filled in. “I got another member right here. So now that we got the minimum amount of members we can keep the club room, right? And get a club budget right?” While senpai kept bugging the president, Kaede quickly caught on that he had just been recruited to meet the minimum member requirement for the club to keep existing. The weird thing was that how could a club around such a popular senpai not have enough members to begin with? The student council president glanced over towards Kaede and signed. Was that a look of pity?! “You do realize that you can not change clubs for the rest of the year, do you?” he asked Kaede with the same pitiful look. Before Kaede could react or even realize what was just being told, Reo-senpai started to drag him along again. “Time for class, let me show you your classroom.” Senpai’s pace was so quick that Kaede didn’t have any breath left over to ask questions. Gino sat in his first class of the day, biology. He had his book out and was chatting with a pretty redheaded girl when something caught his eye. It was Reo looking through one of the windows on either side of the door. He was mouthing something and pointing excitedly to a dark headed kid. Gino furrowed his brow and shook his head, waving Reo away. All while talking to the girl. Of course, she was looking at Reo too, a mix of amusement and confusion on her pretty face. Reo opened the door and entered the classroom. He shooed the girl away before plopping him down beside Gino. "Gino, Kaede. Kaede, Gino." Reo seemed pleased. "He joined the ghost club." Reo had put his hand up to the side of his mouth to hide if from Kaede and leaned close to Gino, his words had been loud whisper. Gino only shook his head and facepalmed. Poor kid. "Get out of here." He batted at Reo who danced away, greeting several students as he did. Gino sighed and gave the new kid a sideways glance. "I'm Gino, like he said. How'd Reo manage to rope you into joining? " First Kaede thought that Reo-senpai would drag him to his own classroom, but that was wrong. He dragged him to meet someone. Someone that didn’t seem very pleased to see him. The first impression that Kaede got of Gino was that he seemed to be a very moody guy. After ‘introducing’ them, Reo just went up and away. Wasn’t he supposed to show Kaede the way to his classroom?! Now he just left him alone here with this guy that also seemed to be part of the club he had just joined. How rude. The way Gino talked just rubbed Kaede the totally wrong way. As if he could just be roped into doing something that he didn’t want to do. “Nice to meet you too,” Kaede said with an obvious sarcastic tone. Gino simply blinked up at the dark headed boy. Excuse me? Was what he wanted to say. What was with the attitude? Gino had merely been trying to be friendly! And this kid cops an attitude with him? "Whatever bro." Gino crooked a finger at the girl he had been talking to and motioned for her to come back, which she did with enthusiasm. He had clearly dismissed Kaede by this point and began his conversation with the girl. He pretended not to notice when the boy left. Reo had been waiting outside the door for Kaede and bounded on him when it opened. "Sooooo how did you and Gino get along? Is he cool or what?" Perhaps the unimpressed look in Kaede's eye should have hinted to Reo how he felt, but Reo only knew what he wanted and that was for those two to be good friends! How could the Ghost Club work if 2 of the 3 members didn't get along with each other?? He turned around on his heels and headed for the door. Not turning back and completely ignoring the presence behind him. He had even forgotten his senpai who practically pounced him, again, as he left the classroom. It’s not like Reo had anything to do with what happened between Gino and him so Kaede choose to ignore the flood of questions. “Where is my classroom?’ he asked instead. Reo-senpai made an expression that clearly showed that he had forgotten his original responsibilities. However, he did try to mask it. “Of course that is going to be our next stop. Actually we are almost there,” he said with a bright smile. “It is right here.” He had only walked a few steps and showed Kaede the door to the classroom right next door. The day had gone by pretty quickly for Gino. He bumped into Reo and Kaede a few times on his way to class, he always had a bored hello for to match Reo's enthusiastic wave and an icy stare to Kaede. Seriously, what was that guy's problem?? It was of little consequence to Gino, he didn't have to bother with it in his classes, all that was left was after school activities. And lunch. Gino sat at lunch, his tray untouched. Reo sat across from him at the large circular table, with Kaede between the pair. Honestly, Gino almost stood up and moved to another table. He could sit wherever he pleased and be accepted. He didn't have to put up with this kid's awful attitude. "So, Kaede, where did you live before you moved here? Why did you move? What do your hobbies include? Do you have a favorite class?" Gino tuned Reo and, by extension, Kaede out. He wasn't interested in this kid's history. Not after he had been a colossal butthead this morning. Kaede was welcomed kindly in his new class. He got lucky to be given a seat at the window. The other students were curious as expected and asked questions whenever they could in between the classes. This give him the nice opportunity to ignore Gino’s presence whenever it appeared. His fellow students attitude changed a little when they asked him about what club he would join and he had answered the ghost club. Why does everyone react with this slightly pitiful glance and then quickly change the subject? At lunch Kaede got kidnapped by Reo-senpai again and was forced to sit with him and Gino at the same table. He really didn’t want having to put up with that annoying guy. Interestingly he seemed to have decided to behave like a little kid and pout without saying anything, so Kaede concentrated on his conversation with Reo-senpai. “We moved because of my parents job relocation,” he answered one of the many questions. It was inevitable for him to notice the constant flood of people that passed by and greeted Reo-senpai. This guy was really popular. And he greeted everyone back by name as well.